NASA’s Mars Reconnaissance Orbiter, which has overhauled understanding of the Red Planet since 2006, has passed 200 terabits in the amount of science data returned. The data returned by the mission alone is more than three times the total data returned via NASA’s Deep Space Network for all the other missions managed by NASA’s Jet Propulsion Laboratory, Pasadena, Calif., over the past 10 years. “The sheer volume is impressive, but of course what’s most important is what we are learning about our neighboring planet,” said JPL’s Rich Zurek, the project scientist for the Mars Reconnaissance Orbiter. 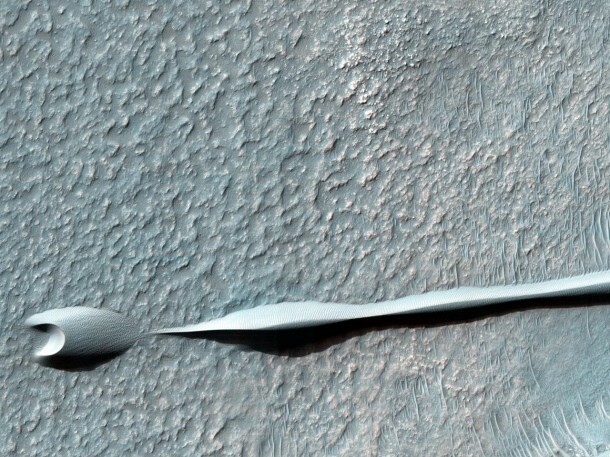 The orbiter’s instruments have examined Mars from subsurface to atmosphere in unprecedented detail. One instrument has provided images revealing features as small as a desk in surface areas equivalent to one-third of the United States (1.92 percent of Mars’ surface). Another has covered areas equivalent to about 82 percent of Earth’s land area (83.6 percent of Mars’ surface), with resolution showing features smaller than a tennis court. These cameras have viewed many areas repeatedly, providing three-dimensional information from stereo and revealing several types of landscape changes over time. Other instruments identify surface minerals, probe underground layers, examine cross-sections of the atmosphere and track weather globally. “The mission has taught us about three very different periods of Mars history,” Zurek said. Data gathered by the orbiter’s instruments and relayed from rovers are recorded onto the orbiter’s central memory. Each orbit around Mars takes the spacecraft about two hours. For part of each orbit, Mars itself usually blocks the communication path to Earth. When Earth is in view, a Deep Space Network antenna on whichever part of Earth is turned toward Mars at that hour can be listening. Complex preparations coordinate scheduling the use of the network’s antennas by all deep-space missions — 32 of them this month. Mars Reconnaissance Orbiter typically gets several sessions every day. The chunks of mixed data from the antenna stations in California, Spain and Australia come to JPL, where software sorts it into specific products, such as an image from a camera, measurements from a scan of the atmosphere, radar readings from the subsurface sounder, or data from a rover. Another process at JPL determines which products to send where — such as to a mineral-mapping team in Maryland, a camera team in Arizona, a radar team in Italy. On a typical recent day, the system sorted 58 billion bits from Mars Reconnaissance Orbiter into 303 data products. 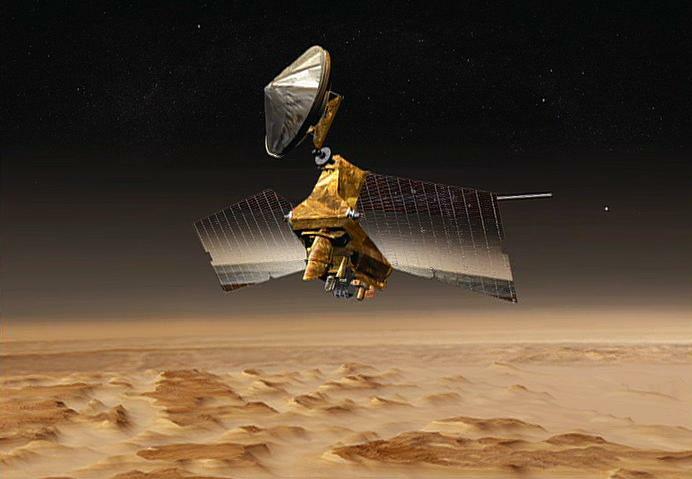 The Mars Reconnaissance Orbiter mission met all its science goals in a two-year primary science phase ending in 2008. Three extensions, the latest beginning in 2012, have added to the science returns. The longevity of this mission and of NASA’s even longer-lived Mars Odyssey orbiter, which has been studying Mars since 2002, have given researchers tools to study seasonal and longer-term changes on the Red Planet. JPL, a division of the California Institute of Technology, Pasadena, manages the Mars Reconnaissance Orbiter and Mars Odyssey projects for NASA’s Science Mission Directorate, Washington. Lockheed Martin Space Systems built both orbiters and collaborates with JPL to operate them. JPL operates the Deep Space Network for NASA’s Human Exploration and Operations Mission Directorate, Washington.